This fall can be best described as frenetic. I now have 29 public events and 5 private ones from Sept. 1 through Nov. 10th. Can you believe that I'm working a arranging a couple more? I'll have 4 or 5 different presentations. Check out my Appearances Page to see the updated list. 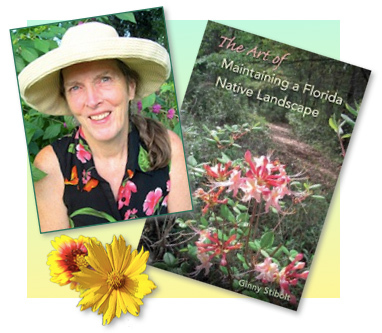 This poster was created by the Cocoplum Florida Native Plant Society Chapter for the 3-hour native plant workshop that they organized and that I'll be leading on Oct. 10th in Stuart, FL. Amazing okra (Abelmoschus esculentus). This crop plant was probably native to Africa, but it's been under cultivation for millennia. There is evidence that it was grown in Egypt as long ago as 2,000 BC. I use the swale method for growing this vigorous plant. I dug four holes, equi-spaced in a 5' square and buried kitchen scraps in the bottom of each hole. I planted 3 seeds in each of the 9 corners around the rims of the swales, because the seeds are 4 years old. When the seeds sprouted, I arranged them so that only one was growing in each of the 9 spots. And 3 months later we have more okra than we can use. Our neighbors look forward to our bounty. 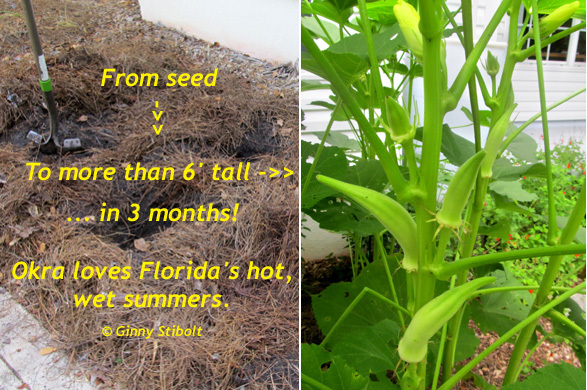 See my post Okra swales for more details. 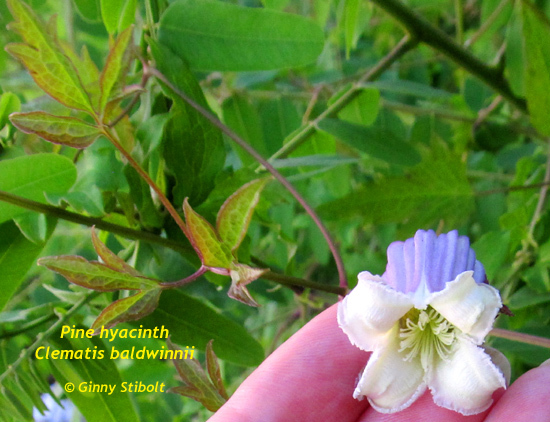 The pine hyacinth (Clemetis baldwinii) is a new plant for me. I spotted this vine on our weekly walks along the St. Johns River in Jacksonville. 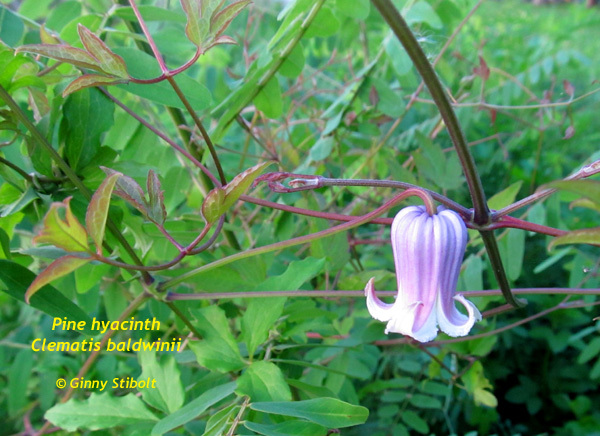 I did not recognize it as a clematis because of its drooping flower, but there is no mistaking it once you know what to look for. Our Florida native Poinsettia turns color much earlier than its more famous cousin. 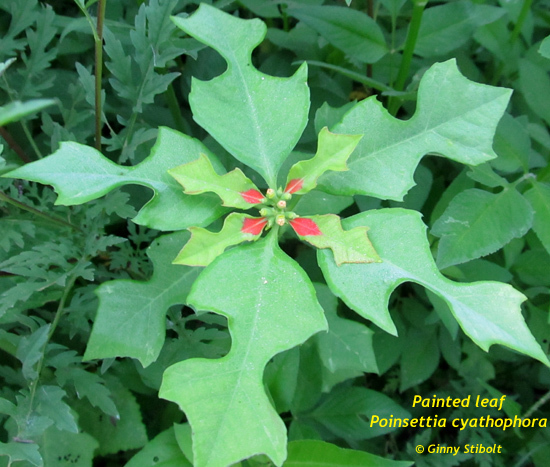 Painted leaf (Poinsettia cyathophora) is a member of the Euphorbia family. The petal-less flowers are grouped into a head with separate male and female flowers and the bracts under the flower head turn red to attract pollinators. This was also spotted on our St. Johns River walk. A sleek black racer sunning itself on a sago. 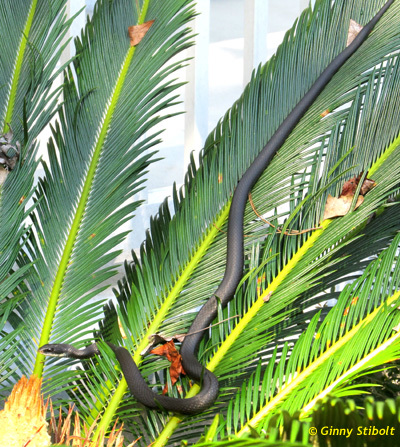 When we saw this black racer out on one of the sagos (Cycas revoluta) by the front porch, We hoped that it was hunting the Cuban anoles (lizards) and leaving the native green anoles to thrive. Trying some real Florida wildflower seeds this fall. 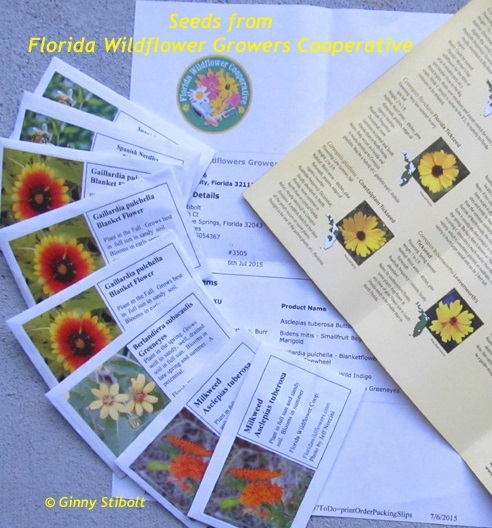 I ordered some seed from the Florida Wildflowers Growers Cooperative to add some good diversity to our meadow areas and to also try to grow some in containers. I'll let you know how it goes. Uh oh, those darn water spangles are back. 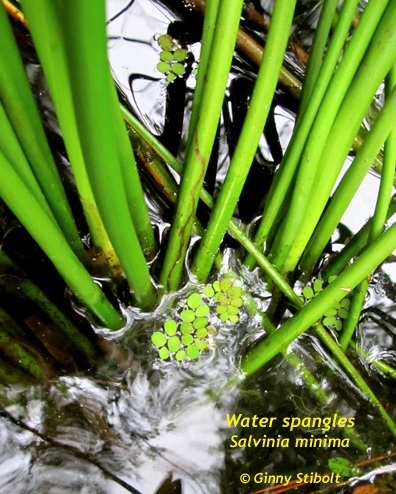 Water spangles (Salvinia minima) is an invasive floating fern from Asia. We were NOT happy to see it back in our front pond. This will be yet another fall project: I'll don my dive booties and step into the pond to fish as much of this stuff out as possible and before it multiplies to cover the whole pond again. I wrote about our battle with this invasive in Managing a natural pond. I hope you have a good list of fall projects to tackle as well.